Perhaps you've thought of trying one of the many at-home handheld devices, such as the Quasar MD Plus that Kim Kardashian uses (apparently, she's "really big on laser facials"). LED skin treatments all the rage nowadays. Here's what you need to know about them. 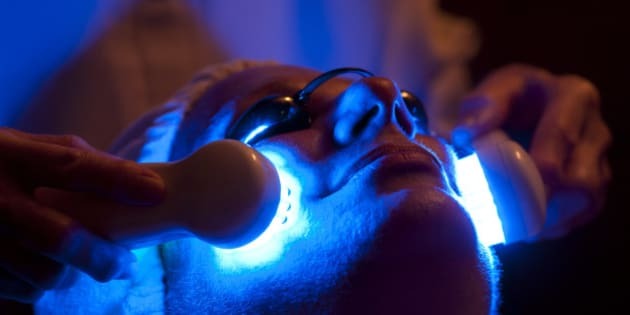 Woman receiving an led blue light therapy treatment during her facial. Low key photo shot in the darkened room; treatment is often performed in dim light to enhance relaxation. If you follow any celebrities on Instagram, chances are you've come across a picture of an LED treatment before. You know that strange-looking serial killer mask that retails for about $2,000? That's it. Or perhaps you've thought of trying one of the many at-home handheld devices, such as the Quasar MD Plus that Kim Kardashian uses (apparently, she's "really big on laser facials"). Or maybe you've seen someone wearing funky protective eyewear at a medispa or doctor's office and all kinds of bright lights were involved? Yep, that would be it as well. LED skin treatments all the rage nowadays. Here's what you need to know about them. Blue light or red light? There are various kinds of LED facials available on the market today, and the technology is rapidly evolving. Some skin treatments involve the use of blue light, while some only use red light. The basic premise of LED skin therapy is that different colours trigger different reactions beneath the epidermis and penetrate the skin at varying depths. Blue light is generally used to kill the bacteria that causes acne, providing an effective treatment for blackheads and whiteheads, whereas wavelengths of red light are normally used to speed up healing and stimulate collagen production, simultaneously shrinking enlarged pores and tightening the skin. LED treatments are painless, non-invasive and no downtime is required. According to Sacha Bourdage, Director of Laser Services at the Victoria Park Medispa in Montreal, Canada, "people are looking for a lot of alternatives these days... An LED treatment is great for targeting areas that are hard to hit with Botox and injectables, bringing out the plumpness and reducing the appearance of crow's feet and other wrinkles." Do LED light facials really work? The treatments can last a mere few minutes, depending on the type of technology used. That's right! Perfect during lunch hour, much? OK, but do they really work? Dr. R. Glen Calderhead, one of the world's leading experts in phototherapy and photosurgery, seems to think so. In a recently published study, he states that "low-level light therapy (LLLT) with light-emitting diodes (LEDs) is emerging from the mists of black magic as a solid medico-scientific modality, with a substantial buildup of corroborative bodies of evidence for its efficacy and elucidation of the modes of action. Reports are appearing from many different specialties; however, of particular interest to plastic surgeons treating the aging face is the proven action of LED-LLLT on skin cells in both the epidermis and dermis and enhanced blood flow. Thus, LED-LLLT is a safe and effective stand-alone therapy for patients who are prepared to wait until the final effect is perceived." So, yes -- but not overnight. And the price is rather steep, too: count on average $50 to $300 per treatment. And although some customers who've undergone blue light therapy claim that most of their dimples disappeared after a single treatment, Bourdage advises caution: "It's not a cure. It's a treatment." Typically, you'll need at least four treatments before you start noticing results. In order to rejuvenate the skin's appearance, improve its texture and reduce the appearance of wrinkles, a few weeks will be required. The good news? The benefits are cumulative, and one treatment per year is normally sufficient to maintain the results afterwards. You can do it at home, too: according to prominent New York City aesthetic medicine expert Dr Z. Paul Lorenc, using a pharmacy-bought LED skincare device can be a great alternative to clinical-grade treatments: "Probably the biggest pro is that it works. Studies conducted using LED for acne and anti-aging showed significant improvement in both. The biggest con is that you have to commit to using it every day. This needs to become part of your daily skin care regimen. For some this may be a burden!" For patients that lack discipline, opting for a more powerful machine might be a better option: "Light is measured in nanometers, and LED lights have different depths. Devices like the one that we have here can only be used in medispas or on a medical level... It all comes down to the expectations you have," says Dr. Lorenc. "LED light has demonstrated significant efficacy for various skin pathologies," says Bourdage. "The LED light by itself can stimulate specific cell lines and improve certain aspects of the skin, and the technology can be further improved when combined with light-absorbing chromophore gel, which allows the LED light to penetrate deeper into the skin. We use Lumibel to reduce the appearance of crow's feet, marionette lines, forehead lines and pore size. For patients with acne-prone skin, we offer a treatment called Lumibel." Here's how a typical LumiBel light-emitting diode session unfolds: the patient comes in after having her picture taken and lies down on an examination table, where the aesthetician uses a gentle cleanser to remove any makeup or impurities before applying a special gel onto her face. The multi-LED LumiBel blue light system is then used to activate the gel, converting the light from the lamp into different color wavelengths. The light panels can also be used on other acne-prone body areas, such as the chest or back. Although the machine never actually touches the skin, the patient must wear protective eyewear. At Victoria Park & other medispas, small stickers can be placed over the eye area in order to treat crow's feet. "How can you expect the LED light to treat your crow's feet if you're wearing these huge goggles?" exclaims Bourdage. Indeed... Make sure you keep this in mind when booking your next appointment! Don't be afraid to ask the receptionist if stickers -- not just goggles -- are available at your local medical spa or dermatologist's office. This particular treatment lasts nine minutes (most LED treatments are over in less than twenty minutes), during which a warm, pleasant sensation can be felt over the entire face. While you're there you can listen to some background music, mediate, even take a power nap -- honestly, the whole process really isn't as freaky as it may sound. After the treatment, once the gel is delicately removed, a moisturizer is applied along with an SPF to protect the skin from UV rays. Flushing very rarely occurs. That's right, you're free to walk around town or go right back to work -- no one will ever guess what you were doing just a few minutes before. "Most of our patients find it relaxing!" Bourdage candidly points out. And based on their comments and the technology's commercial success, it certainly seems like it's here to stay.